The Circus Parade lines a hallway leading to The Carolina Club. 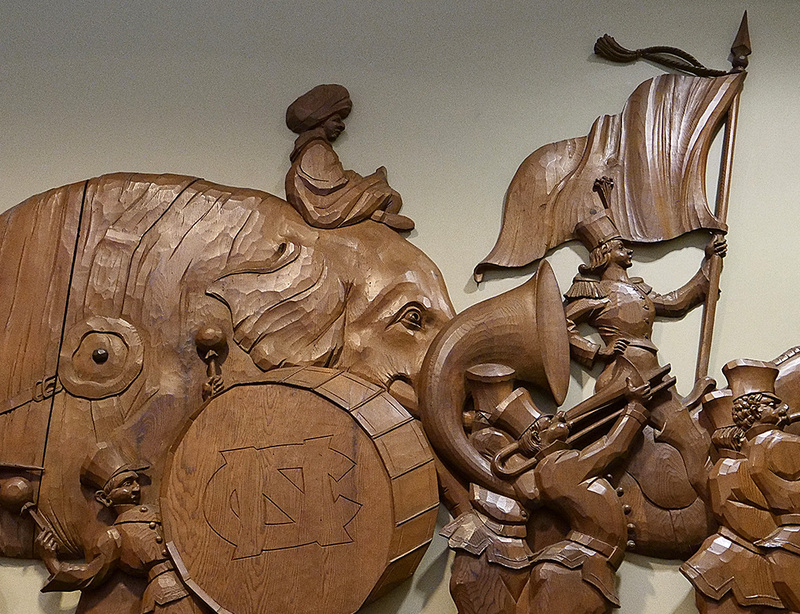 One of the most distinctive features of the center – the Circus Parade – seems entirely at home marching around one entrance to The Carolina Club, but this relief carving actually came to the center as an afterthought. The carving – 25 feet long and almost six feet high – was first in the Monogram Club and later in The Carolina Inn cafeteria. 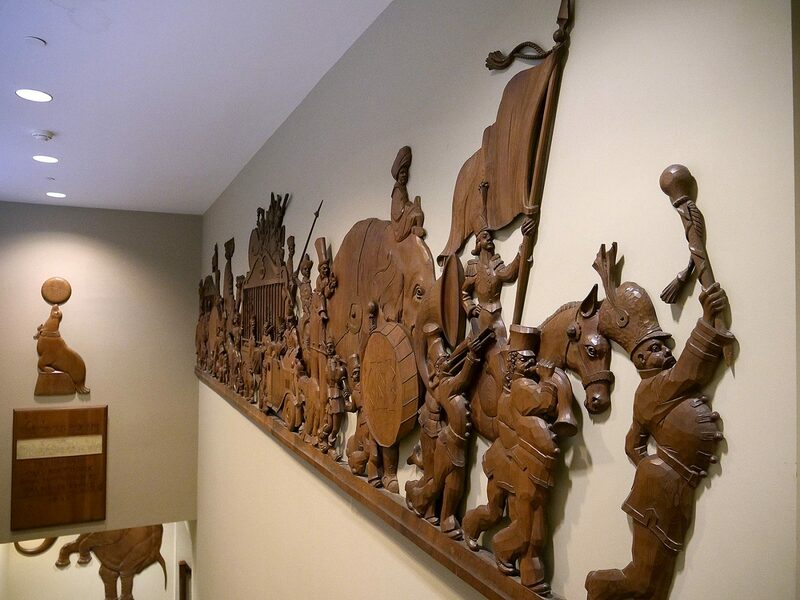 The Inn needed to find a new home for the carving after its renovation, and the carving happened to fit perfectly in the stairwell’s high ceiling. Carl Boettcher carved the Circus Parade about 50 years ago from sketches drawn by William Meade Prince, a magazine illustrator who grew up in Chapel Hill. Boettcher, born in Pomerania in 1886, studied art until World War I. After the war, shell-shocked and seeking a new beginning, Boettcher and his wife, Millie, joined relatives in the United States, and Boettcher returned to his life as an artist. But the Depression left little need for woodcarvers, and the Boettchers moved on, this time to Newton, N.C.
Boettcher worked for the buildings department at UNC for six years until someone discovered his talent as a woodcarver. He spent his last three years at UNC with his own workshop practicing his craft for the University and – literally – leaving his mark at UNC. Boettcher’s other carvings at UNC include the gate to Forest Theater, the University seals in South Building, the Bowman Gray swimming pool plaque and the Monogram Club seals. He also did work for the Morehead Planetarium.